In the not-too-distant future, television audiences became bored with modern reality television. No one cared anymore about dancing competitions with washed-up stars, or what new singer was about to be discovered that sounded just like all the others before her, or even surviving on some deserted island. When a new law was passed to absolve studios of liability for the death or injury of contestants, "Mortality Television" was born, where contestants truly risked life and limb for fabulous prizes! 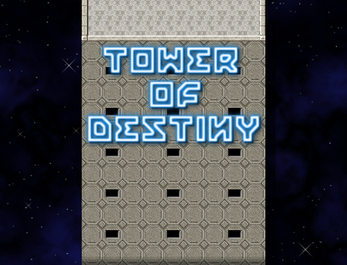 The most famous of these shows was "Tower of Destiny." Contestants are chosen at random from a list of applicants and must climb to the top of a tower through randomly selected mazes with various obstacles in their path, all while the audience scores them points for their actions. If the contestant makes it through, they must face Judgement, where the points from randomly selected audience members are then tallied. If the score is high enough, then the contestant wins the Grand Prize of $1,000,000! Otherwise, they get the consolation prize. 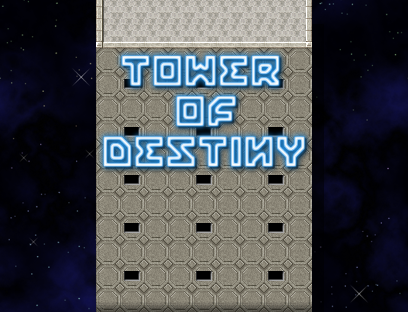 So step right up and try your luck, and life, in the "Tower of Destiny"! Download and extract the .ZIP file. Open the "Tower of Destiny" folder and open the "Game.exe" file to run.